nd, victims of illegal wildlife trafficking, we took immediate action. Adrian Harland, currently Animal Director at Howletts, and an expert in the care of large carnivores, accompanied by Jane Hopper, our experienced Head of Veterinary Services, raced to help. What follows is Adrian’s account of events, and a clear example of the terrible suffering caused by the illegal trade in wildlife. Dying cheetah cubs – the message came through to The Aspinall Foundation on a Thursday evening at the beginning of October. 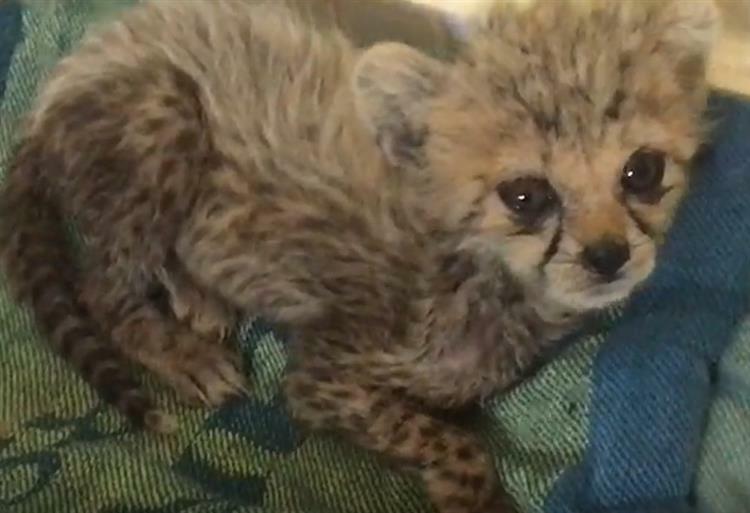 Fourteen cheetahs confiscated from animal traffickers in Somaliland, three of them tiny cubs and very ill can you help? Friday, rush to London to get visas. Book the next available flight. Jane, the vet, puts together an emergency medical kit. We both update vaccinations (there is a cholera outbreak at present). Sadly a cub dies as we fly out on Saturday. We arrive in Hargeisa, the capital of Somaliland, on Sunday morning dreading what we will find. A second cub is dead. The third cub is still alive… just. We set off to the private house where it is being kept, desperate to do what we can before it is too late. The tiny female cub is just skin and bone with terrible diarrhoea. 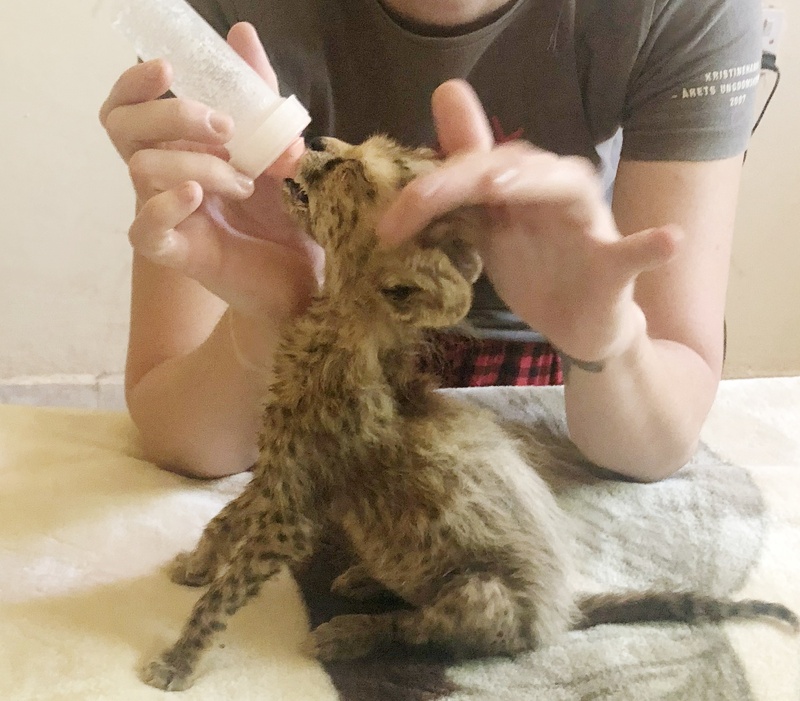 We are relieved to find a volunteer from the Cheetah Conservation Fund is already there and helping to look after her. Jane assesses the cub and gives her broad spectrum antibiotics. She also takes a stool sample for analysis. We later find out the only vet lab in the country is not advanced enough to run the diagnostics Jane needs. Where are the other cheetahs? When we go into the yard we see makeshift pens holding a further four cheetahs between six months and three years old. The two older cats have deformed legs. Either from inadequate diet when young or from having their legs bound together for the long journey in a smuggler’s truck across the desert to the coast. The cubs are snatched from their mothers in the wilds of Somaliland, Ethiopia and Kenya, and then travel for days to the coast to meet up with some Somali pirate who will ship them as pets to rich buyers in Arabia. As we leave the house I am shown three caracals living in a bare room. They have been here for over a year. Other rooms hold another two caracals and an owl brought in with a damaged wing. The yard has two vultures recovering in it, a three legged donkey hit by a car and a number of rescued antelope. A short drive later we are at the Rescue Centre itself. It is a similar story. Five younger cheetahs are in three even smaller pens. A quick glance in the enclosure reveals at least two of them are suffering from colitis – a digestion problem common in cheetahs. They are all completely lacking in muscle tone – not surprising as they do not have enough space to exercise. The world’s fastest mammal unable to run. We meet the vet student, in her last year at university, who cares for all the animals. She lives on- site, her office is her bedroom which she shares with an eight week’ old cheetah cub. This cub, a bundle of energy, was one of two confiscated some weeks earlier, the sibling died soon after arrival. The body of the last cub to die is produced and Jane carries out a post mortem on the single table that also serves as a study desk and dining table. There is no obvious cause of death and we know there is nowhere in Somaliland to run tests. Samples are preserved in the hope they can be sent to CCF’s lab in Namibia in the future. The full story emerges; these cheetahs have been confiscated over the past 2 years not all at once. In the last six months the Somaliland government has made a determined effort to stop animal trafficking. They were an easy route for smugglers but now animals (mostly cheetahs) are confiscated and traffickers fined and imprisoned. This must be applauded but the country’s only rescue centre cannot cope with the sudden influx. I arrange to meet the Director of Wildlife to discuss how TAF could help. The Director and I go to visit Debbis, a proposed reserve, 90 minutes’ drive out of the capital. We hire two armed guards to protect us on the journey. The reserve is nowhere near completion, it is not fenced and there are goat and camel herders everywhere. The planned area is only one square kilometre, the cheetahs will just be in large enclosures, re-wilding these cats has not even been considered. I ask to meet the Minister for Environment and an appointment is arranged for the following day. The Minister starts by saying the cheetahs are Somaliland’s and must stay in the country. I point out that Somaliland is not ready to care for them yet. I explain TAF’s aim is to reintroduce animals wherever possible, I give examples of our projects in Congo, Gabon and Indonesia. I suggest the cheetah should go to centres in neighbouring countries or South Africa – places that can deal with the problem now. The Minister is surprised we do not want to take them to our parks in the UK. I assure her nothing could be further from our aims. If a suitable reserve can be created in Somaliland TAF would absolutely be in favour of reintroducing cheetahs. The Minister decides she will support our proposal and will present it to the President. Meanwhile Jane has been improving hygiene levels, organising and supplementing the small medical stock the centre has and writing simple health protocols. A microscope has been discovered and Jane has shown how to scan faecal samples for parasites. She has also given training in how to use a recently arrived dart gun. We then vaccinate all the cheetahs and discuss dietary changes that will not only reduce colitis but also save money. The little cub has responded to treatment and is improving. I bury the two that did not make it. TAF’s input has not ended with our trip. Jane is in daily contact with the Rescue Centre, the older cub is ill now and Jane is advising on medication. TAF is investigating where best to send the cheetahs and our trustees are lobbying the Somaliland President about short and long term solutions. It was a flying visit that may result in a policy change which will improve these cheetahs’ future. It certainly resulted in one little cub now having a future!